Hannah is a member of ARIA (Association of Rhode Island Authors) as well as a graduate of Pine Manor College's Solstice Program in Creative Writing where she earned an MFA in Writing For Young People. She resides in Bristol, RI with her husband, two daughters, and two cats—Woody and Zoe. 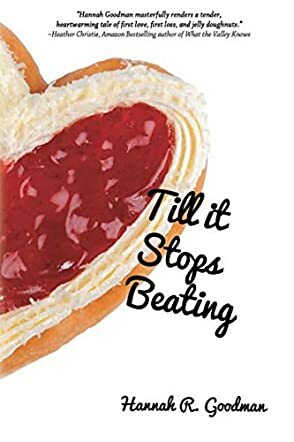 Till it Stops Beating by Hannah R. Goodman is the fourth book in a series. Maddie Hickman is 17 and is about to enter her senior year. An old flame turns up, a member of her family is diagnosed with cancer, and she’s hit with anxiety and panic attacks. In the midst of all this, Maddie is trying to live a normal life, trying to keep up with all her friends and get her college applications in. The stress is proving too much for her though and, eventually, it all comes to a head. Her heart is beating fast and it’s time she listened. A road trip offers her the chance to see that if she really wants to live her life, she must risk everything. Till it Stops Beating by Hannah R. Goodman is a mixed bag of emotion! I haven’t read any of the others in the series but I found myself falling into this book as though I had. There is plenty of laughter, tears, shock, and surprise in this book and no reader will be able to stop themselves running through almost every emotion known. It is the perfect story of teenage angst and emotion and the characters are both funny and very vulnerable; relatable and people that we can all identify with. It’s a fun story with plenty of ups, downs and sideways moves that will keep you reading until the end. I feel that Hannah has done a great job at dealing with all that teens have to face these days. Loved it and I think it’s a great book, not just for teens but for adults too.